I need you boo, I gotta see you boo. And there're hearts all over the world tonight, but Chris Brown will be cartoonized tonight! Chris Brown is an R&B artist who is very, very, very well-known in the entertainment industry today. He debuted in 2005 at the age of 16, with an album featuring the hit single "Run It." After that, Chris' success became clearer and clearer, as he consistently topped different charts all over the world with his other songs, such as Kiss Kiss, With You, No Air, and Forever... ever...ever. 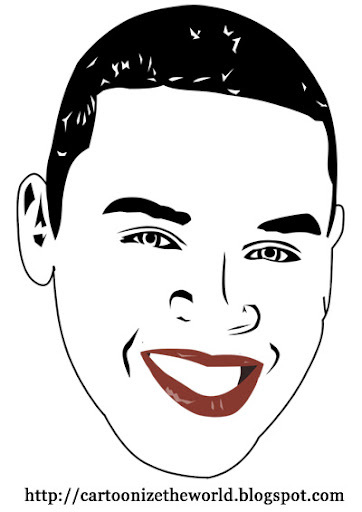 Chris Brown, you've been cartoonized. Tomorrow is the day. The day that Cartoonize The World will be giving away the exclusive wallpaper featured 2 days ago. Take note though, only those who have already subscribed to our e-mail database will receive this e-mail. If you are not yet part of this, be sure to sign up now here! Not only will you receive news on the latest cartoons in your inbox, but you will also be receiving weekly freebies from us! How cool could that be! See you all again tomorrow! Please also help us to... SPREAD THE WORD, CARTOONIZE THE WORLD! Special thanks to Chris-Daily for the support! Chiis Brown, you are young, aspiring, smart and full of talents,this shall soon past. Leave that Bum alone let her go back to Barbados, she is going to get you into trouble. I love that Canadian babe, she is such a lady in that photo. i HAVE NO RESPECT FOR RIHANNA.ipersonally think she lied to the police. She hid her ROLE, AND THE COO-COO AND FLYING FISH PEOPLE THINKS SHE IS SUCH AN ANGEL. lATER FOR THEM. Move on and bring the Canadian into the picture. What is those guns for? that does not help her image.